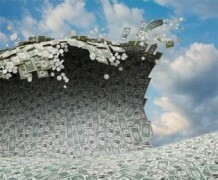 Here comes the money wave! Fintech funding stories can be fun if they are brief. MoneyLion, a mobile personal finance platform (PFM), has raised $22.5 million in Series A funding led by Edison Partners. Existing investors, including FinTech Collective, Citizen.VC, Clocktower Ventures, Broadhaven Capital Partners and Montage Ventures also participated in the funding round. MoneyLion says it “leverages machine learning analytics to enable smarter tools and credit products” – providing an app that is a single place to track spending, savings and credit. The company claims its approach is “unique” in the consumer lending industry. Its Series A financing round, together with $650 million in existing debt facilities, “will fuel MoneyLion’s growth and significantly expand its lending capacity”, the company states. Finicity, a US-based provider of real-time financial data aggregation and insights, has secured $42 million in its Series B funding round led by Experian. Bridge Bank and a number of existing investors also participated in the round. Thomas Fast, MD at Ultra Advisors, an independent investment banking division of KEMA Partners, advised Finicity on the transaction. The company says “the funding will focus on growth at Finicity Data Services while also reinforcing operations at sister businesses Mvelopes and Aurora”. Steve Smith, co-founder and CEO of Finicity, states “the emergence of the open financial web, and our ability to access and analyse account data, is enabling new thinking in financial services”. London-based blockchain start-up SETL has received an investment for an undisclosed sum from Deloitte. David Myers, head of capital markets at Deloitte, believes “blockchain has the ability to transform the industry” and says his company has been “investing heavily in real-world applications, such as identity management, cross-border payments, loyalty, trade finance and a number of others”. SETL and Deloitte have worked together on a recent “smartcard” project for Metro Bank. Deloitte is currently setting up a financial services blockchain centre in Dublin that will house a team of 50 specialists and focus on the EMEA markets. It is working with five companies in the distributed ledger tech (DLT) space: BlockCypher, Bloq, ConsenSys, Loyyal (formerly known as Ribbit.me) and the Stellar Development Foundation. The new Applets automate actions based on users’ own pre-set conditions. A major milestone in the Jack Henry and Geezeo partnership. Australian digital bank offers personal finance management tool.